There are songs about death. There are movies about death, books about death, games about death. And yet, the $20 billion industry surrounding how we handle our dead is often invisible. It’s an industry that exists deep in funeral home basements or cramped offices, one that people only talk about reluctantly and in the worst circumstances. 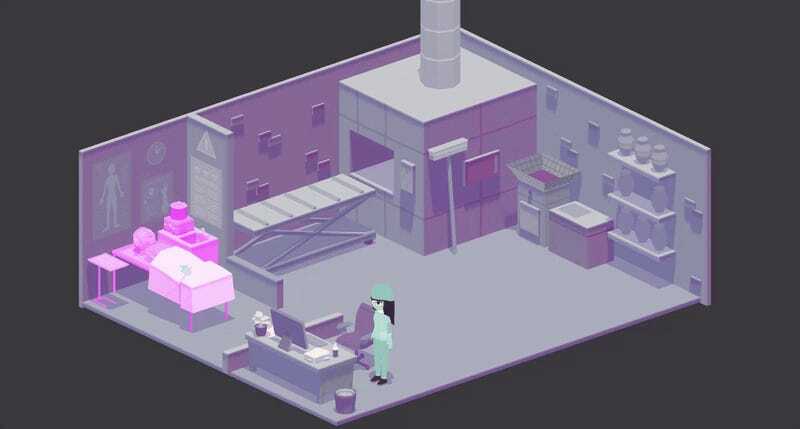 It’s one I had never imagined the day-to-day of before playing A Mortician’s Tale, a remarkable “death positive” indie game about the people who work with dead bodies. A Mortician’s Tale, out October 18th, is an hour-long game about Charlie, a newly-minted mortician at a mom-and-pop funeral home. Every morning, emails from her boss relay how clients want her to lay their loved ones’ bodies to rest. “Today’s funeral is for a woman who died from breast cancer,” her boss instructs her. “Nothing fancy, just a standard cremation.” After reading through her inbox, Charlie meanders over to the embalming or cremation area to work on the corpses. Then, Charlie attends each funeral, overhearing mundane funeral conversations and paying her respects. Sometimes, things are more complicated: Charlie’s boss forwards her a note from a father whose son committed suicide. Although his will stated he wanted to be cremated, the father orders the funeral home to “disregard our son’s will.” Charlie has to decide whether she’s comfortable going forward with a traditional burial, despite the boy’s wishes. At another moment, Charlie must remove a pacemaker from a body that’s about to be cremated so it doesn’t explode. These small glimpses into the corpses’ former lives break up the morbid prepping routine while adding some—again, morbid—logistical nuance to Charlie’s day. In addition to her boss, Charlie regularly corresponds with her best friend, who works with corpses at a museum, about how she’s tired of dates being too scared to ask about her day. Her friend confides that she once dated someone who was too into her job. “What would a mortician’s private emails look like?” is a question I now regret never asking. There’s also Charlie’s colleague Matt, “the man who delivers bodies to ya,” a blue-collar death workers who treats the job like any other. He regularly shoots Charlie emails asking her to grab mozzarella sticks and beer after work, a sort of decompressing ritual that, I imagine, lots of death works might rely on. Surely by design, the icky parts of prepping corpses quickly became less icky as I fell into a rhythm. The emails I received detailing gory or tragic deaths began to feel like toneless instructions. When it’s time to embalm a body that Matt has delivered, the player selects a sponge, cotton balls, a needle and thread, and other implements of the trade from a menu and drags them across various areas of a body. After you forget that you’re touching a dead body, it feels a little like following any other set of instructions—baking, fixing a bike. I was surprised how normal funeral conversations, usually dreaded and uncomfortable, eventually became after recognizing enough patterns. Funeral attendees self-consciously whispering about how they’d rather be watching Netflix or taking a meditative walk felt less tone-deaf and more, well, You do you, man. A term A Mortician’s Tale taught me is “death positivity.” The game is about accepting death as an inevitability and embracing the diversity of attitudes and customs surrounding it. Talking about death—and not in sterile terms like “passed on”—makes it easier to accept, the philosophy goes. The game didn’t hit me over the head with “positivity,” but, even through its matter-of-fact attitude toward draining blood or gluing eyes shut, it was always conscious of the type of emotional labor that goes into working at a funeral home—talking to loved ones, meeting families’ logistical needs, hearing feedback on funerals services. Its tone also lands somewhere outside of the intense sorrow or emotional detachment we associate funerals with. That’s what helps open up space for the player to engage with the industry professionals. At Rose and Daughters, the mom-and-pop shop where Charlie works, it’s taken as granted that families can bring their own food to services or bury the dead however they see fit. The home is cognisant of how formaldehyde, used for embalming, affects the earth, something I’d never thought about. When Rose and Daughters is bought by a bigger company, it quickly becomes clear that they were exceptional. Hillside Heritage Enterprises Inc. threatens Charlie when she doesn’t upsell clients on funerary packages. They sell expensive food to families and force them to host their services in their dreary facility. I won’t spoil the ending, but later, we’re given another, even more positive perspective on the industry once Charlie earns her chops. Why was it so striking, though? In its refreshing brevity, A Mortician’s Tale is eminently successful at what it sets out to accomplish. It’s wholly pleasant and always instructive, even in its mundane moments, which, in themselves, are educational. It pries open a less accessible life experience and gives players the opportunity to understand a real-world perspective that, likely, is quite unlike their own. It elicits dark feelings, but asks players to consider where those feelings came from and what makes them dark.